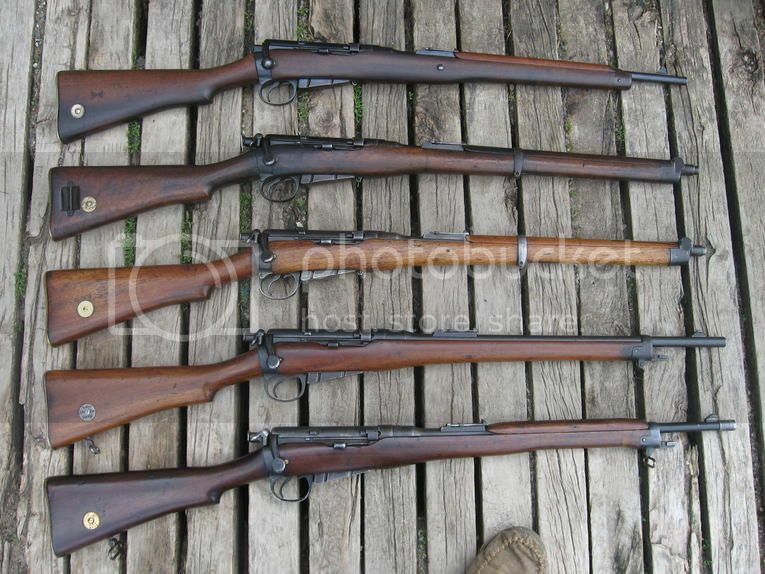 Hello, I was just inquiring as to whether or not there are any companies that specialize in Lee Enfield rifles like CanWest Sport Distributors www.lee-enfieldrifles.com still in business? Any gunsmiths familiar with the Lee Enfield rifle platform would also be greatly appreciated. I'm just looking for contact information on any company/anyone that works on Lee Enfield rifles. Thanks in advance for any and all thoughts, opinions, or answers. LEC is as you deduced Lee Enfield Carbine. There were a number of variations. What you have started out as an 1898 Lee Enfield cavalry carbine. It was converted into a Royal Irish Constabulary carbine, witnessed by the bushing fitted to the muzzle. This is so that the thin lightweight barrel of the cav carbine could mount a P1888 bayonet, the barrel being too small to fit the bayonet ring. There is one more official conversion, that being a Baltic carbine conversion of the CLLE rifle, but rare as rare can be. Damn fine rifles,, So what is the story on why it is so rare???? Many thanks, I do need to find out more on that Rare Baltic conversion you showed.. What is its story and why so rare??? Only thing cooler then an original untouched rifle is one that has been taken and converted by another Country to fit their needs..
Now the one Enfield conversion that comes to mind is the Turk Enfauser.. But I really like the look of that Baltic conversion also..
Now here is a loaded question.. Anyone know of some more Enfield official conversions like this??? Would this rifle be using the older black powder rounds or the newer cordite ammo? The Mk II round-nosed bullet was found to be unsatisfactory when used in combat, particularly when compared to the dum-dum rounds issued in limited numbers in 1897 during the Chitral and Tirah expeditions of 1897/98 on the North West Frontier of India. This led to the introduction of the Cartridge S.A. Ball .303 inch Cordite Mark III, basically the original 215-grain (13.9 g) bullet with the jacketing cut back to expose the lead in the nose. Similar hollow-point bullets were used in the Mk IV and Mk V loadings, which were put into mass production. The design of the Mk IV hollow-point bullet shifted bullet weight rearwards, improving stability and accuracy over the regular round-nose bullet. These soft-nosed and hollow-point bullets, while effective against human targets, had a tendency to shed the outer metal jacket upon firing; the latter occasionally stuck in the bore, causing a dangerous obstruction. The Hague Convention of 1899 later declared that use of expanding bullets against signatories of the convention was inhumane, and as a result the Mk III, Mk IV, and Mk V were withdrawn from active service. The remaining stocks (over 45 million rounds) were used for target practice. The concern about expanding bullets was brought up at the 1899 Hague Convention by Swiss and Dutch representatives. The Swiss were concerned about small arms ammunition that "increased suffering", and the Dutch focused on the British Mark III .303 loading in response to their treatment of Boer settlers in South Africa. The British and American defense was that they should not focus on specific bullet designs, like hollow-points, but instead on rounds that caused "superfluous injury". The parties in the end agreed to abstain from using expanding bullets. As a result, the Mark III and other expanding versions of the .303 were not issued during the Second Boer War (1899–1902). Boer guerrillas allegedly used expanding hunting ammunition against the British during the war, and New Zealand Commonwealth troops may have brought Mark III rounds with them privately after the Hague Convention without authorization. To replace the Mk III, IV, and V, the Mark VI round was introduced in 1904, using a round nose bullet similar to the Mk II, but with a thinner jacket designed to produce some expansion, though this proved not to be the case. IIRC the cordite but RN bullet, not the Mk VII. It is also interesting that the use of the wooden 'filler' in the nose of the 303 round was 'frowned upon' as wood splinters getting into the would / could cause infection. Never mind his arm has just been blown off, he might get some germs in the stump !!!! !